Pocket PC Forensic Software is world class investigator utility that allows you to examine Windows based Pocket PC and PDA mobile device and is fully capable to extract files, database records, operating system registry records, phone information in an easiest way. The surveillance software designed by our experts easily monitor for analyzing Pocket PC phonebook information and shows details including Contact details, Phone model, IMEI number, SIM information, Manufacturer details of any supported windows based mobile cell phones handsets. Pocket PC monitoring and investigator software supports all Smart Phones and Pocket PC mobile phones such as Samsung SCH-i730 Pocket PC phone, Samsung SGH-i300, Samsung SCH-i600, Sharp W-Zero3 PocketPC Phone, Siemens/AT&T Wireless SX56 PocketPC Phone Edition, Sierra Wireless Voq Phone, Texas Instruments WANDA reference design, T-Mobile MDA, UTStarcom PPC 6700 UTStarcom XV6600, Voxtel W740, Yakumo PDA omikron BT etc to send the SMS. Pocket PC forensic examiner tool investigates all detailed information of Windows Mobile phones including Pocket PC, PDA and other similar devices. Software extracts Pocket PC’s files and folders, Database, Operating system registry details and Phone information. Show details of software and hardware architecture of Pocket PC like OS type and version, Processor architecture, Memory usage and related information. Examine phone information and extracts Phonebook number, Appointments, Task, IMEI number, SIM Information, Contact details, Phone Model, Manufacturer details and other related information. Analyze record saved summary to the user’s defined location for further use. 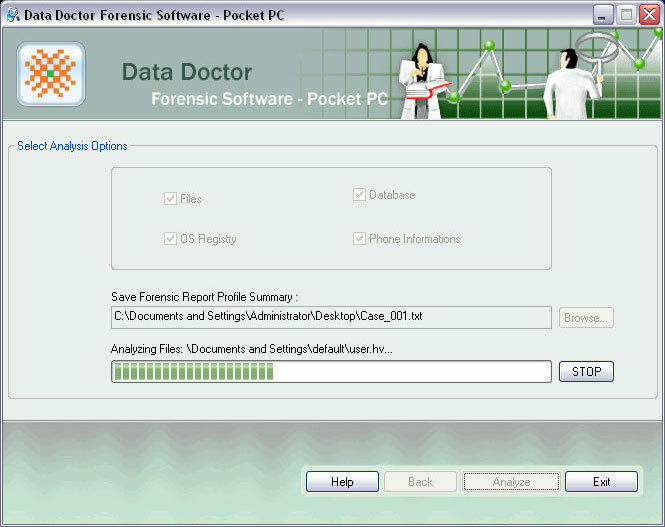 Download the FREE demo of Pocket PC Forensic Software from the link given below to fully understand the software functionality. Upon satisfying you can order for the full version.